The most frequently asked question of those interested in becoming a volunteer Professor Know-How concerns the curriculum and whether it is difficult to teach. Do I need an engineering background is another common question. The answer to both questions is "No." What you will need to do is take a class one or two times and complete an online video training workshop. If you choose to begin as an assistant, you will have all the training necessary to lead a class on your own after a few sessions. The secret to making the presentation easy is in the "specially crafted" teaching aids we use and a step-by-step lesson plan that is simple to follow. As a Professor, you do more in the way of guiding, than teaching. Kids naturally learn best by doing. 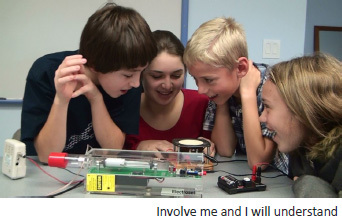 Our "involve me and I will understand" approach is an amazing example of the effectiveness of hands-on learning. What follows is an overview of our lesson plan explained in both words and photos. We took a 10 hour program and condensed it so it can be read in about 10 minutes. Although it's not required reading, the tour will capture your imagination and may very well inspire you to take the course. The premise for our technology series is that we are surrounded by countless electronic devices that we rely on every day, yet most of us, including young people who are particularly good with computers, lack a basic understanding of how these modern marvels work. In our technology series, we unlock the secrets of these mysterious devices by exploring the underlying principles of electrical energy. In doing so, we soon discover the empirical law of physics known as the Law of Conservation of Energy. This law simply asserts that energy can neither be created nor destroyed; it can only be transformed from one form to another. 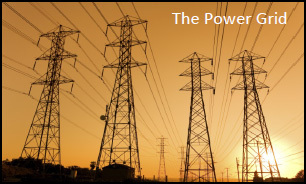 Electricity is the vehicle used to distribute and transform the energy that powers our modern world. This is an especially important concept to consider as we approach new ways to both harness and conserve electrical energy. Organized and presented as cascaded modules, we begin our lessons with a review of the atom, its basic structure and magnetism. 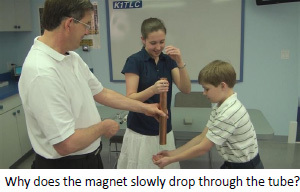 We review the magnetic properties of the various metals we will use in our experiments and conduct a mysterious experiment that dramatically illustrates how magnetism and electricity (two fundamental forces of nature) are interrelated. We call this experiment the "Antigravity Magnet". Understanding exactly what electricity is and how the energy it contains can be dangerous if used improperly; safety is our first order of business. We begin by reviewing the lab permission form signed by both the parent and student that covers the safety procedures and the rules for the lab. The first lab activity begins by exploring batteries: the storage devices that supply portable power for everything from automobiles to electric toothbrushes. Various types of cells are examined, measured, and dismantled to unlock the secrets of how these devices work. Kids love to take things apart. The dissecting of technology is an integral part of our teaching method. 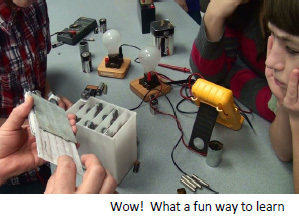 We now go about building various cells and converting the energy stored in simple chemical solutions to power an electric fan, a light bulb and a radio. Lemon juice and saltwater are among some of the harmless electrolytes we use to create what are called "voltaic cells". 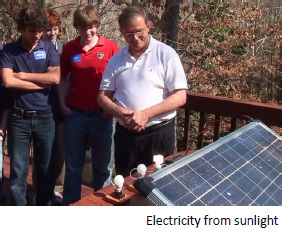 Our next module explores photovoltaic cells. Solar cells as they commonly are called, transform the energy of sunlight to electricity. Again, we power an array of different appliances and learn both the advantages and limitations of producing electricity from the sun. We will reintroduce the photovoltaic cell later in our experiments when we visualize wireless communications by transmitting voices and music via a laser beam and around corners through fiber-optic cable. The discussion of using electricity converted by solar panels as an alternate source of energy introduces the subject of conservation. 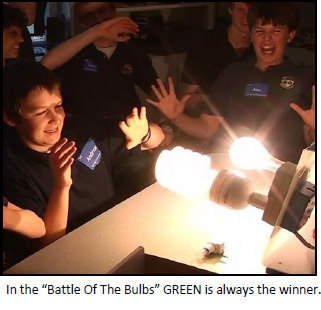 Our next lesson, "The Battle of the Bulbs", uses two special meters to simultaneously measure the power consumption of older "Edison" style bulbs with new "CFL" compact fluorescent and LED bulbs of the same brightness. This very visual comparison highlights the energy efficiency of new technologies and demonstrates one important way we can conserve energy without compromise. The focus of our next unit is the electricity that can be produced by applying pressure to a crystalline substance. We call this type of energy piezoelectricity. The operation of a barbecue igniter is demonstrated in this experiment and then visually recreated with the "Crystal Collider". 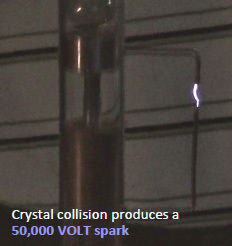 A harmless, but very impressive, 50,000 volt spark is created when a brass ball falls down a clear plastic tube and collides with a crystal. We also create impressive sparks and illuminate a neon tube by applying pressure to a crystal locked between the jaws of a vice. 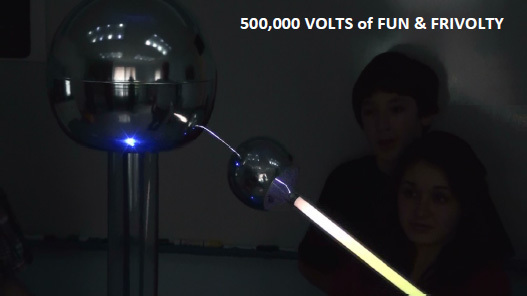 Creating 50,000 volt sparks by crashing objects into crystals are the kinds of things that appeal to boys and girls of this age and our next experiment produces lightning bolts of a half a million volts. A specially designed Van de Graaff generator is used to demonstrate static electricity by illuminating bulbs containing various gasses. The same energy is used to create eclectic hairdos that have the kids bubbling with laughter. 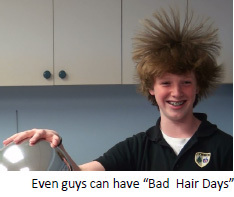 The Van de Graaff generator is just plain fun! We call our next unit "Fire & Ice". 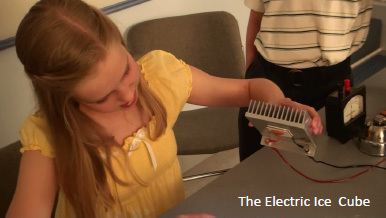 In this section we discover how energy expressed by a temperature difference can be transformed into electricity. 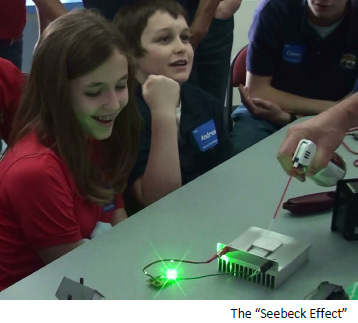 Named in honor of its discoverer, we call the energy created by a temperature difference the "Seebeck Effect" and the device a thermocouple. Hundreds of thermocouples are assembled neatly in a package called a thermopile. A thermopile is akin to a battery in that it combines multiple cells to increase the total energy output. Like all of the experiments in our technology series, the thermopile is used to power a lamp, a radio and an electric motor by comparing the ambient temperature of the room with both hot and cold surfaces. Thermopiles are also used to power spacecraft that prowl the darkness of space. The process is reversed and energy is transformed when an electrical current is applied to the thermopile creating a temperature difference. 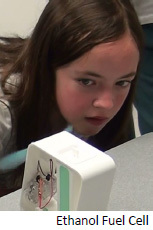 The dramatic experiment culminates with the creation of an "Electric Ice Cube". 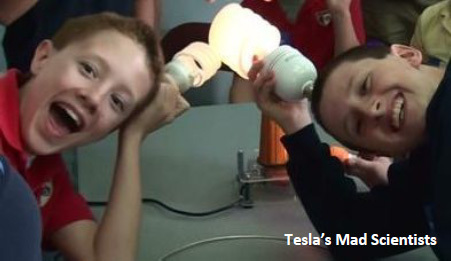 We also introduce history into our lessons by paying tribute to the inventors and the inventions that have led to the evolution of our electric world. Providing insight into the events that led to their discoveries, we include personal antidotes about these famous inventors and the kinds of things they liked to do when they were kids. One of our favorite stories encompasses the life and discoveries of Michael Faraday. 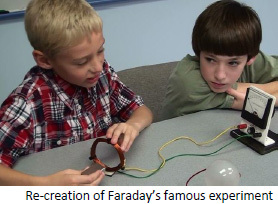 Faraday, who is recognized as the "Father of Electricity", provides a great segue to our next topic, electromagnetism. Electromagnetism is the primary method by which most of the electricity we currently use is converted. Once again, we utilize multiple hands-on demonstrations of how magnetism makes electricity and electricity makes magnetism. This is the science that explains the mystery of why the magnet in our "Antigravity Magnet" demonstration defied gravity and slowly floated through a copper pipe. This also explains how sunlight reaches the earth and how our power plants and power grids work. In our next module, we explore how the natural solar energy of the wind can be captured and converted to electricity by electromagnetism. Using a scaled down model of an actual wind turbine and a fan to simulate the wind, the turbine illuminates a small model home and powers the radio. 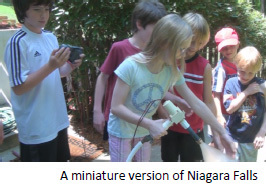 Using a similar turbine, we create a miniature version of the world's first hydroelectric plant at Niagara Falls. We use the pressure of water flowing through a garden hose to spin the turbine and convert the energy to electricity. 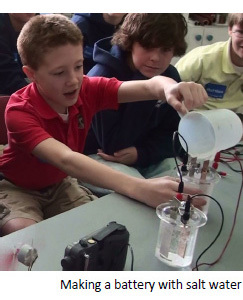 Using a unique and vivid model of an electric motor, our students learn how an electric motor works and how the energy contained in electricity is changed to mechanical motion. 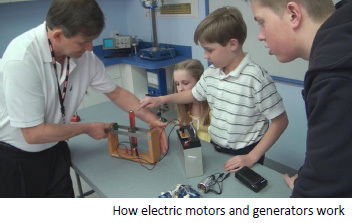 The concept is illustrated by reversing the process and discovering that motors and electric generators are one and the same device. The concept is further demonstrated in our unit on sound waves when we explore the operation of a microphone and loudspeaker. We conclude our energy unit with two very exciting alternative energy technologies: hydrogen and ethanol powered fuel cells. Using distilled water and an electric current generated by the wind turbine or solar cell, water molecules are disassembled into their basic elements of hydrogen and oxygen. The process is called electrolysis. In this experiment, the students can readily see the decomposition take place as the bubbly gasses accumulate in their separate test tubes. Reversing the process, electricity is generated as the gasses recombine to make water. 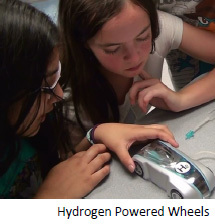 The entire process is presented in the operation of an actual working model of a hydrogen powered car. Pollution free and producing water as its only exhaust, the hydrogen fuel cell transforms the energy contained in hydrogen to electricity. That electricity is then converted by a motor to supply the mechanical power to move the car. Capturing and converting the energy contained in plant life to ethanol and then transforming the energy to electricity is yet another form of renewable energy. With the aid of a special fuel cell, we convert the energy contained in denatured alcohol to electricity. Produced without combustion, the electricity that results is used to power an electric motor that spins a fan. The ability to easily convert energy to electricity and change it back to other forms has forever changed how we live. Electricity has made it possible to transport energy around the globe whenever and wherever it is needed. 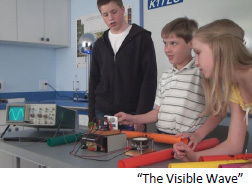 Having concluded the energy units, our next subject is called "The Visible Wave". Here, our young scientists explore sound waves by observing the various patterns their voices make as they speak into a microphone. The patterns are visually displayed on the screen of an oscilloscope. The loudness and pitch of the sounds they make allow them to visually grasp the concepts of frequency and amplitude. A microphone and loudspeaker are disassembled to explore how both of these devices work to transform sound energy to electricity and back to sound again. Named after its inventor, a Tesla coil provides the hands-on introduction to electromagnetic waves and high frequency alternating currents. Tesla was awarded the patent for radio in the United States, but his most important contribution to our modern electric world was the power grid and the alternating current "AC" motor that powered the second wave of the Industrial Revolution. In addition to wirelessly illuminating various lamps, we discuss the battle that he and American inventor Thomas Edison had over how to distribute electricity across great distances and why Tesla's "AC" system won out. Wireless communication devices are used almost everywhere today. Radio, TV, cell phones, GPS satellites, Wi-Fi computer connections and even the remote control that sits on the coffee table, are all forms of wireless communication. Radio, as it used to be called, is quite easy to understand and is exquisitely demystified in our unit on electromagnetic waves. Revisiting our earlier experiments with electromagnetism, we soon discover that the invisible waves of radio are simply an ongoing exchange of energy as electricity and magnetism recreate each other as they travel through space. The laser and the beam it generates can be found just about everywhere. They are used in medicine as surgical tools, barcode scanners at the checkout counters in stores, CD and DVD players, and provide the method of transmission of data that weaves the world wide web we call the Internet. A half century ago, Dr. Ted Maiman invented the laser beam when he worked at the Hughes Research Lab in Malibu, California. 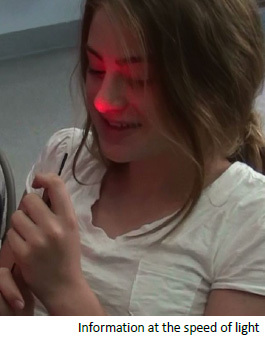 The device flashed a bright red spot onto a photo detector across the room. A helium-neon laser is used in our next experiment to recreate his experiment. Combining the electrical signals from a microphone with the laser beam, music and voices are carried across the room via a visible light beam. Our next experiment uses a fiber-optic cable to actually see how this vital part of our telecommunication infrastructure works. 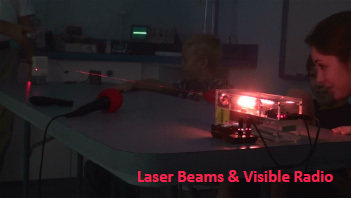 What we see and hear in our laser and fiber optic demonstrations is a visual representation of radio. When we lower the frequency of the light beam to where we can no longer see it, we find ourselves transmitting electromagnetic waves in the infrared portion of the spectrum. This is how the remote control on your coffee table works. Using their new knowledge of radio, the kids conclude their adventure by creating a radio show where they talk about all the fun things they have learned. The broadcast can be heard over FM radios throughout the school. 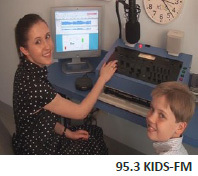 We call our station KIDS-FM and the kids really enjoy being DJs and hearing themselves over the radio. 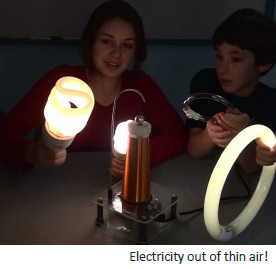 Of all the different ways we have seen energy expressed and transformed, the most exciting of all is the transformation of energy the kids now have for science. Having participated in this one of a kind program, one can only imagine the lifetime memories it has created and kinds of contributions these young people could make to our world should they choose a career in science & technology. Wouldn't It Be Wonderful If It All Began With A Program At Your School? You Could Be The One That Gets It All Started!